Probiotics help acidify the colon, inhibiting growth of harmful bacteria, fungi, viruses and parasites. They help to normalize bowel movements, reduce intestinal gas and bloating, diarrhea and constipation. 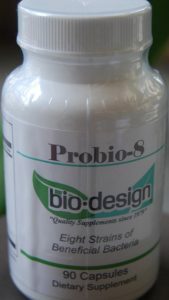 Probio – 8 provides eight strains of beneficial G.I. colonizing bacteria. It is produced in small batches to insure freshness. Keep in a cool place tightly closed; it is not necessary to refrigerate. Probiotic supplementation may help maintain a healthy lower G.I tract. Probiotics help acidify the colon, inhibiting growth of harmful bacteria, fungi, viruses and parasites. They help to normalize bowel movements, reduce intestinal gas and bloating, diarrhea and constipation. They promote production of B vitamins and vitamins A and K and short chain fatty acids. They may help maintain healthy cholesterol and triglyceride blood levels. They help detoxify environmental toxins such as pesticides and pollutants as well as cellular waste. They participate in breaking down and rebuilding hormones. They help to break down protein and mucus buildup in the colon. people who frequently drink alcoholic beverages. Take 1-3 Probio-8 capsules several times daily, increasing dosage increases effectiveness of G.I. tract colonization. Excipients : Purified Gelatin, Cellulose, Maltodextrin, Silicon Dioxide, Magnesium Stearate. Suggested usage : Take three or more capsules daily as directed by your healthcare professional.